New website for Leet Noobs with excerpt and testimonials! It’s basically a major reediting with additional material thrown into the mix of my dissertation. One of the surprising revelations I had while rewriting the book was that maybe the group fell apart in part due to their newfound conceptual understanding of how threat worked. What I mean is that, as they learned how the underlying math worked in the game, and as they focused more and more on efficiently exploiting this new knowledge, they inadvertently were also undermining their original motivations for playing. If this is true, what’s that mean?? Conceptual understanding can kill community? Was the way they were originally playing illegitimate? Anyway… interesting to think about since most people in education take for granted that conceptual change/understanding is all we care about. Or download the PowerPoint used in my dissertation defense! I’ve moved slightly away from thinking about WoW as a two phase (two stage) process. I mean, it is helpful and maybe ethnographically correct–as in some players see it that way–but the line between the stages is very blurred, especially for anyone leveling up a character after their first one. I wrote a paper that started out as me describing these two stages more. I intended to include things such as chat data and video analysis to illustrate the stages better, but I didn’t have time to do that kind of analysis for the deadline, so instead I turned it into a “how did ethnography help me” kind of paper, which seemed to make sense since it was for a special issue of Transformative Works and Cultures on ethnography and games. As for “Leet Noobs,” I am considering using it as the title for my dissertation, which, at this point, looks like it will be recasting the various publications I have through the lens of Actor-Network Theory/Distributed Cognition (maybe some Activity Theory thrown in, to boot) and be done by December 2009. 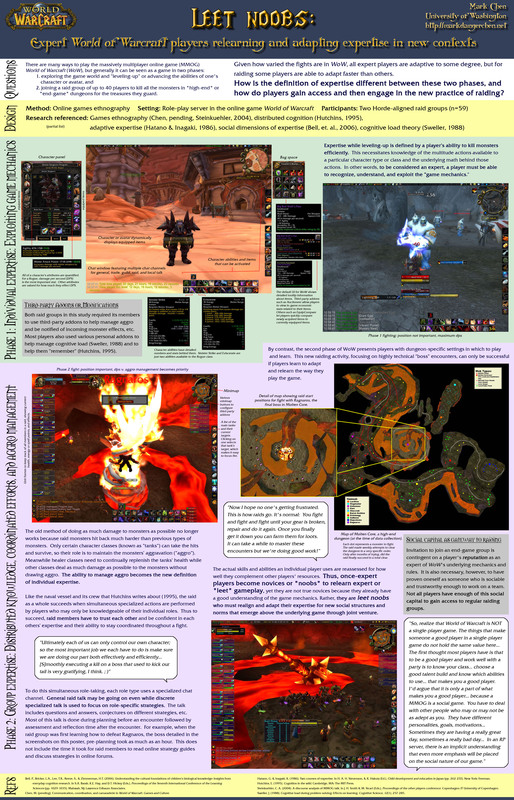 As part of a poster session on the development of expertise in everyday contexts at the International Conference for the Learning Sciences (ICLS), I created a poster that contrasts two phases of expertise development in World of Warcraft. 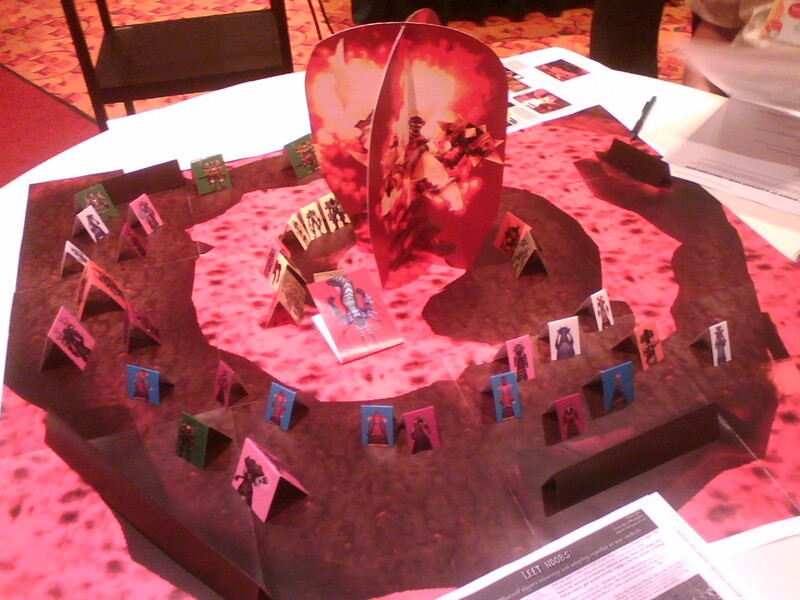 I also presented the same topic at Games Learning Society (GLS) a week later, but instead of using a poster, I printed out hand-outs and a map of a fight in Molten Core along with little paper figures to demonstrate with interactives what a raid fight looked like. This page is meant to document the various iterations of this topic, and it will eventually include drafts of a paper I’m writing on it (due September 1). The second phase occurs when an expert player joins a raid group and has to adapt his or her practice to work on a team. This phase is much more social, and, in fact, from the get-go successful access to a regular raid group depends on a player’s social capital and networks. Once in a group, max DPS (damage per second) is no longer the most efficient way of killing monsters. Instead, each character class has a specific role to play, whether it’s tanking, healing, decursing, doing damage, or what have you. The coordinated and collective effort of the group members is important. The group works on a distributed level and the whole group is often considered one entity, but at the same time individual players have to keep track of their own actions. The process of learning and keeping track of personal stuff while maintaining relationships and successfully communicating and coordinating with the group is the new definition of expertise. The new raid activity requires new expertise. Thus leet players become leet noobs, experts who seem like newbies since they are in a new social context. Chen, M. (pending). 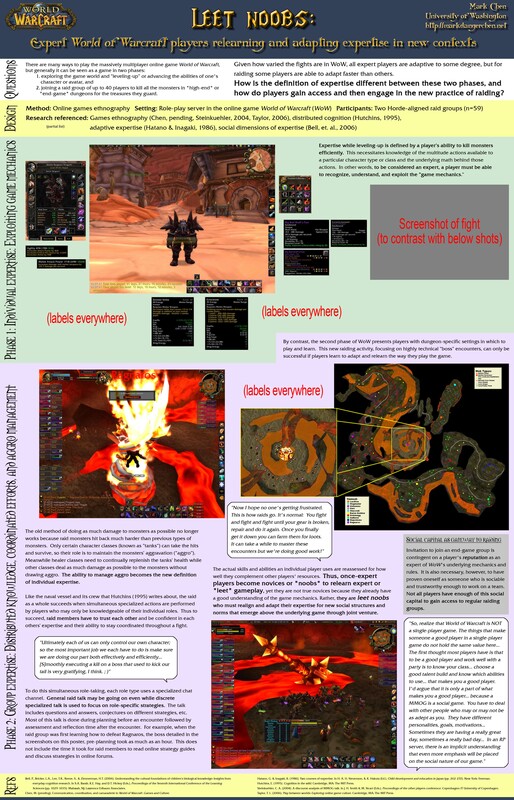 Communication, coordination, and camaraderie in World of Warcraft. Games and Culture. In Everquest, I moved to a special server at one point. The relevant part of this, is that it was (at the time) the only option for people coming from the PvP servers to move to a regular raid setting. 1) you had an entirely new social setting, both because the new server involved a new group of people, and because the behavior of majority pvp players vs. majority non-pvp players is different. 2) Even non-raid character details change when you move from pvp to non-pvp. Important stats, what you pay attention to, etc. all have to change. There was some conflict with people thinking *I am the best at my class because I mastered pvp intricacies* vs. *I am the best at my class because I am the most successful raider*. I won’t be able to thank you enough for the posts on your web page. I know you placed a lot of time and effort into these and hope you know how much I appreciate it. I hope I could do the same for someone else someday.